I received the most adorable sample kit ever this week from onli beverages. It included a bottle of each flavor they offer and an armful of onli swag and info. First things first. Onli Beverages is a locally [Palm Beach] owned company offering all natural, chef-inspired sparkling beverages. Their goal of “elevating taste” has been achieved through combining complex flavors and health-beneficial ingredients to produce a luxurious and refreshing line of thirst quenchers. Not only are they delicious on their own, they also make amazing mixers for 21 and up-friendly libations. I first discovered onli at Publix Greenwise at Legacy Place when they were hosting a tasting and had no idea they were local – which happens to be a lovely surprise. Now on to the fun stuff. Looking at this box of goodies, I debated the best use of liquids. And decided to offer a thought and a cocktail for each flavor – 7 tastes and 7 boozy recipes. Being a South Florida native and writing for a blog called EatPalmBeach, I decided each cocktail would pay homage to my beautiful hometown and what we have to offer. I hit Publix Greenwise for some produce and Total Wine for a slew of mini bottles. I started with the onli Lemon Watermelon. On its own, the flavor is light, sweet and crisp. The watermelon really shines through with the lemon stimulating your taste buds. The finish was smooth and delicate flavor-wise and invigorating with the bubbly sensation of the carbonated water. Next up was the onli Espresso Swiss Hazelnut. I love having a cold coffee to grab on the go, so I was really excited for this one. This flavor is no joke. The espresso and hazelnut are bold and silky and give you the jolt you’re looking for in the morning. Even the aroma as you open the bottle is strong and awakens your senses. The hazelnut is rich and nutty with a smooth espresso finish. This is definitely a good option for those looking for a decadent morning beverage on the go or after-dinner treat. For a cocktail, I imagined sipping this by the pool while reading a book when it’s too hot out for coffee or as an after-dinner cocktail. The ice cream adds a really nice creaminess. The Hibiscus Pomegranate Strawberry caught my eye next. I appreciate that this flavor is unsweetened. I liked this one a lot. The hibiscus gives it a nice floral flavor that’s really smooth. The pomegranate definitely shines and the strawberry has a sweet tartness. It’s a nice departure from the typical super-sweet juice or soda. The finish feels like you just ate a handful of fruit. It’s crisp and fresh and light. I think my favorite is the Green Tea, Lemongrass, Mango. I love green tea and mango is one of my favorite fruits though.. so it may not have been a fair fight. The green tea flavor is the star in this show with the mango creating the perfect after taste. The sweetness is spot on and lingers in your mouth without an overly sugary experience. This would be my go-to for a beachside beverage – with or without any boozy addition. It’s refreshing, tropical and citrusy. 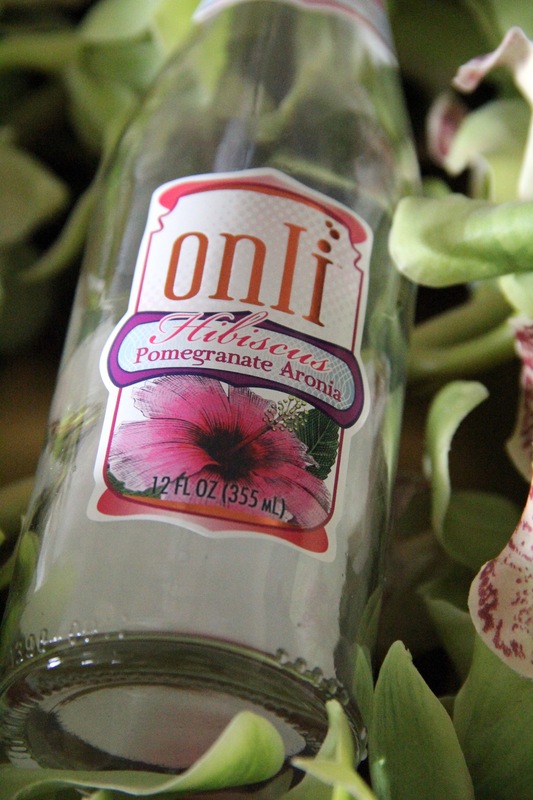 The Hibiscus Pomegranate Aronia is really good. It’s sweeter than the Hibiscus Pomegranate Strawberry, still with the floral hit of hibiscus and the sweet & sour punch of the pomegranate. The aroma alone is mouth-watering. I didn’t know what an aronia was (Hey! I’m being honest!) so I looked it up and apparently it is a North American super-berry, similar to an acai. I think this flavor feels the healthiest if that makes any sense. It’s light and refreshing and just tastes like a beverage that is full of antioxidants and goodness. I had planned to add Cointreau but after a taste decided this was already delicious enough on its own.. and who doesn’t love a super simple cocktail?! The Lemon Mango Passion & Mint was super refreshing with the mint giving it a clean and cool finish that almost tingles your nose. The lemon is invigorating and leaves your mouth watering while the mango and passion fruit give it some body. It’s a nice sweet and citrusy mix. And, even though the lemon is highlighted on the bottle, I really thought the mint stole the show on this one. The Huckleberry Pomegranate has that sweet but tart flavor. It perks up your taste buds and has a strong, sweet aroma that reminded me of a cobbler. The pomegranate takes the lead but the huckleberry really balances it out and gives some extra sweetness. I hope you enjoy some of these Palm-Beach inspired cocktails! Or at least a few bottles of onli on their own. I think they’re a great alternative to water, juice or soda and perfection for any girly event – bridal shower, baby shower, etc. – with the beautiful pops of color. They work amazingly as mixers and are a healthier substitute for soda or juice cocktails (plus you get the bubbles!). On another note, I can’t wait to check out the chef-inspired collaborative flavors they are cooking up with some of our local culinary talents like Chef Clay Conley of Palm Beach’s Buccan and Imoto. Keep an eye out for their small batch releases.. HUGE “thank you” to onli Beverages for sending me this amazing package of liquid goodness to play with!